The White House regularly selects a variety of recipients for the program, ranging in the past from faith leaders on climate issues to immigrant innovators, from educators to entrepreneurs, and more. The goal of the program is to inspire young people to continue working to make a difference in their communities. Arizona’s Latino voting bloc is being slowly built and jostled into action, but it’s not quite a tour-de-force just yet, according to Latino voters groups and policy analysts. When the world’s largest producer of colostrum-based products needed more well-trained employees to expand its Phoenix operations, it looked to the Greater Phoenix Chamber of Commerce. And through its local business-concentrated Phoenix Forward initiative, it delivered. 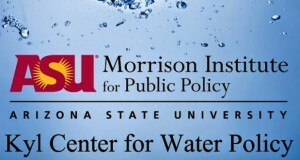 The Kyl Center for Water Policy opened last November at Arizona State University’s Morrison Institute for Public Policy. Since Sarah Porter was hired as director in January, she and her team have set out to resolve the long-standing issue of determining the nature, extent and relative priority of water rights in Arizona. The process is known as general stream adjudication. Arizona’s health care system may experience some cloudy days as the state may soon face its greatest nursing shortage since the 1970s. According to the U.S. Department of Health and Human Services Health Resources and Services Administration, 16 states are not going to have an adequate supply of nurses by the year 2025. Mark Bolzern traveled 3,700 miles to go to the dentist. The 56-year-old Anchorage, Alaska, native left home this spring, made a pit stop in Las Vegas to pick up a friend, and kept heading south, all the way to Los Algodones, Mexico, a small border town teeming with dental offices. Wet weather in May and June prompted optimistic projections Monday from federal water managers keeping close tabs on the Colorado River water supply for about 40 million residents in seven Southwest U.S. states. As of this year, a customer can enter the Bank of America at 44th Street and Thomas Road drop off his latest deposit and leave – all without interacting with a human teller. The University of Phoenix, which runs an online college popular among military veterans, is under federal investigation for possible deceptive or unfair business practices, its parent company the Apollo Education Group told shareholders July 29.